I watched this for the second time tonight, and it seemed to resonate with me even more on the second go round. Gosling's much talked about performance is fantastic as is the soundtrack (much of which is performed by Broken Social Scene). I was impressed the most with Shareeka Epps performance the first time I saw this film in theaters, and after a second screening I find it absolutely disgraceful that she didn't receive an Oscar nomination, especially over Abigail Breslin from Little Miss Sunshine. In all honesty I found her performance to be just as convincing if not more so than Goslings. I wasn't a huge fan of all the handheld camerawork being used, but it remained consistent and worked well enough. Fleck also does an excellent job of delivering his message without overstating anything and coming across as pretentious as there is a real naturalness and realism to the situations and characters spliced with a few touching bittersweet scenes and subtle moments of humor. I'm kind of ashamed to admit that it took me a second viewing to jump start an interest in raving about a film that has been getting positive feedback for almost a year no. 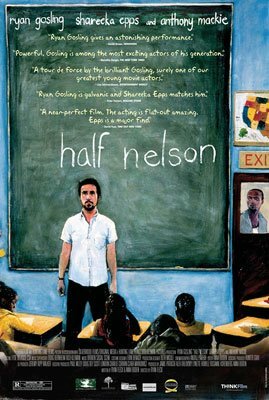 Not that I didn't appreciate it before, however it's just all the more clear how great a film Half Nelson really is.